No location is more emblematic of the blend -- or clash, depending on how you view it -- of Newport's maritime past with modern development than Goat Island, where this modest and relatively ancient stone lighthouse stands alongside a massive resort hotel. For almost 350 years, Goat Island, about six-tenths of a mile long in a north­-south direction and now attached to the rest of the city by a causeway, has been utilized in just about every way imaginable -- from fort to hotel, torpedo station to marina, barracks to condominiums. The deep, protected harbor at Newport was the key to its development from the start. Newport was long an important point in the infamous Triangle Trade. African slaves were traded in the West Indies for sugar and molasses, which was used for rum in Newport. After recovering from British occupation during the Revolution, the city prospered as a center for whaling, fishing, foreign trade, and shipbuilding. By the early 1820s, it became clear that a lighthouse was needed to help guide vessels into the harbor, and on March 23, 1823, Congress appropriated $2,500 for that purpose. Contractor David Melville finished a lighthouse at the northern tip of the island by the end of 1823. Keeper Samuel Watson first illuminated the multiple oil lamps in the lantern on January 1, 1824. The lighthouse exhibited a fixed white light, visible for 14 nautical miles. 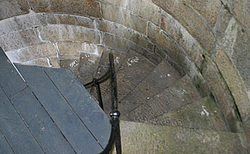 The 20-foot octagonal freestone and brick tower was fraught with problems almost from the start. Lt. Edward D. Carpender inspected the station in 1838. He pointed out that the lantern, 5 feet high and 4 feet wide, was "altogether too small for the convenience of the keeper." Carpender said he found the light "in the filthiest condition of any light in the district." A dangerous reef extended out from the northern end of the island, and vessels often went aground there. In the late 1830s a breakwater was constructed over the reef. It was planned at first that the lighthouse would be relocated to the end of the breakwater. Instead, a new 35-foot granite tower was erected on the breakwater. The tower was built in 1838, but didn't go into service until four years later. The Army Corps of Engineers completed the breakwater in 1842. The old lighthouse remained in use until December 18, 1842, when the new tower was lighted for the first time. The original system of multiple lamps and reflectors was replaced by a fourth-order Fresnel lens in 1857. The original lighthouse tower was relocated to Prudence Island in 1851 and remains in operation there today. The keepers continued to live in the original house until a new dwelling, connected to the lighthouse, was built in 1864. John Case spent a decade (1853­63) as keeper. The next man to take the position, John Heath, died on September 24, 1868, and his wife received the appointment to replace him. Mary Ann Heath remained keeper until 1873, when Henry Crawford succeeded her. During the last half of Crawford's decade at Goat Island, his wife, Lydia, had the official title of assistant keeper. Having a comfortable two-story house attached to the tower certainly made life easier for the keepers and their families, but Mary Ann Heath must have had quite a scare when a tremendous storm on September 8, 1869, carried away about a third of the slate roof and damaged her boat, which parted its moorings. In 1869, the U.S. Navy took over Goat Island, and the island's Fort Wolcott became the new Naval Torpedo Station. The first self-propelled torpedo, the fish torpedo, was developed here. During World War II, the station became the largest employer in the state, with more than 12,600 employees. Eighty percent of the torpedoes used in the war were produced at Goat Island. Keeper Charles Schoeneman, who arrived in 1883, would become such a fixture that locals often simply referred to the lighthouse as Schoeneman's Light. Keeper Schoeneman spent a remarkable 39 years at the station. He was responsible for saving the lives of several sailors from the destroyer Myrant in 1912. The men were fishing from a sailboat that was overturned by a sudden squall, and the keeper quickly went to their aid. He was in his seventieth year at the time. 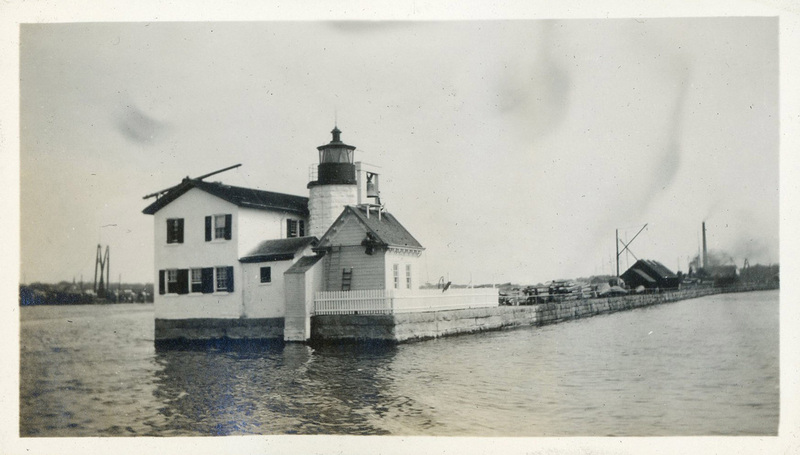 On November 9, 1921, the 155-foot submarine N-4 rammed the breakwater near the lighthouse, causing damage to the foundation of the keeper's dwelling and signaling the end of the staffed light station on Goat Island. Charles Schoeneman retired during the following year, and the keeper's house was demolished. The light was electrified, and personnel from the torpedo station took over its operation. During the monumental hurricane of September 21, 1938, the Pequonnock, a boat owned by the Fall River Line, struck the breakwater at Goat Island before finally going aground at Gould Island. The severe damage to the breakwater left the lighthouse isolated for a time, but eventually a new structure was built to reconnect it to the island. The torpedo station ceased operations in 1951, and Goat Island was transferred to the city of Newport. The light was automated in 1963. The area between the lighthouse and shore was filled in when the Goat Island Sheraton Hotel was constructed. The hotel later became the Doubletree Islander, the Hyatt Regency, and more recently Gurney's Newport Resort & Marina. The care of the lighthouse was licensed in 2000 to the American Lighthouse Foundation. In late 2006, Lescarbeau and his crew of the Abcore Restoration Company built a new picket fence around the perimeter of the foundation. The fence, which is similar to the fence that formerly surrounded the tower and dwelling, was built for safety reasons. Newport Harbor Light, known to most locals as Goat Island Light or simply "the Green Light," continues as an active aid to navigation, its fixed green light 33 feet above the water. ​You can walk through the hotel to reach the lighthouse. It's a good idea to stop at the hotel desk and let the staff know your intentions; they'll gladly direct you to the lighthouse. This fence was built around the lighthouse in 2006. 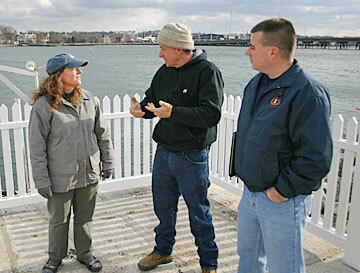 Mary Jo Valdes of the American Lighthouse Foundation, Keith Lescarbeau of Abcore Restoration, and Bob Trapani, executive director of the American Lighthouse Foundation, discuss the new fence in December 2006.